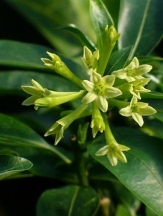 The doubly delightful large double florets that surround the fertile flowers are pure white and age to deep chartreuse and continue to be showy through summer with a backdrop of deep green foliage. 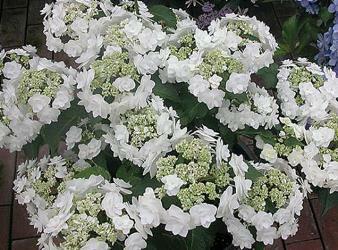 Double Delights™ Wedding Gown Hydrangea flowers on both old and new wood providing a long season of interest. 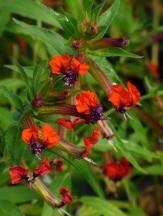 By flowering on new wood this ensures that plants grown in the coldest portions of its range will still flower and this extends the flowering season elsewhere.Double Delights™ Wedding Gown is also mildew resistant and has a compact spreading habit. With the Big Leaf or French Hydrangea, Hydrangea macrophylla, the flower color (the sepals, as a unit they are florets, are actually the part we most enjoy but they do look so much like petals themselves) will vary depending on soil pH. Alkaline ph soils produce pink flowers, neutral pH soils produce purple, and acid pH soils produce the true blues. Actually it is the availability of Aluminum in the soil which is required for Hydrangea macrophylla to produce the color pigment delphinidin. In acid soils you can imagine the Aluminum ions being literally dissolved into the acidic water and being absorbed by the roots of the plant. You can even lime one side of the plant and put Aluminum Sulphate on the other half and produce all three flower colors on the same plant if you get it right. In soilless mixes, like the peat moss or bark based potting soils that they are typically found growing in at the nursery, there is no Aluminum for the Hydrangea to take up, unless it has been added by the grower, therefore the flowers will end up being pink. With white flowered forms of the Big Leaf Hydrangea the florets generally remain white although they may blush pink or blue and the fertile flowers may be blue or pink depending on the soil pH. Most pruning is generally done after flowering and should be completed before the end of summer. Timing may not be as critical with the repeat flowering Big Leaf Hydrangeas but is still the recommended practice for the best spring flower show the following year as well as overall plant vigor. Prune to shape as desired or to reinvigorate by removing no more than 1/3 of the oldest canes near ground level. We generally only do touch up pruning just before growth begins in spring just to remove the spent flower heads and remove any dead, weak, or freeze damaged wood. 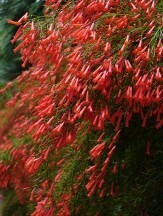 With periodic renewal pruning only if vigor seems reduced which is a rarity. Dr. Michael Dirr's book Hydrangeas for American Gardens, ISBN 0- 88192-641-8,is probably the most in depth publication covering practically all Hydrangea species and all but the newest cultivars. Images courtesy of Star Roses, all rights reserved. Please be advised that humans and/or animals may have allergic reactions if part(s) of this plant are consumed or by coming into contact with sap from bruised or broken plant parts: All plants parts are considered poisonous if ingested.